Roman Syria. Philip Philadelphos style silver tetradrachm struck under Augustus. This coin copies the Seleukid issue Philip Philadelphos tetradrachms, but was struck later after Syria came under Roman rule. 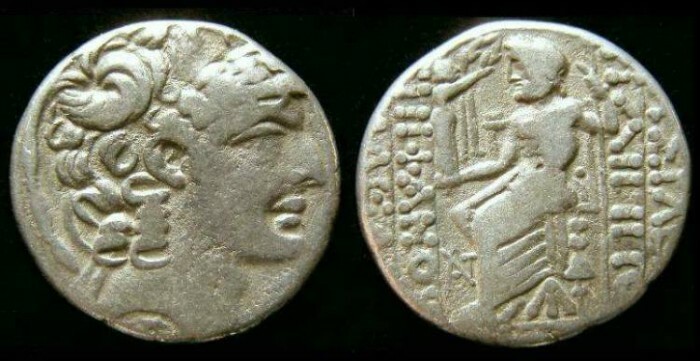 The date mark on this coin is missing, but the style places it in the very late issues struck under Augustus. Reference : Prieur 13 to 26 (the date mark is uncertain). Size : 24.6 x 25.4 mm. Weight : 14.03 grams. Reverse : Zeus seated , with BASILEWS FILIPPOU EPIFANOUS FILADELFOU in four lines to the sides (part of the inscription is off the flan which is normal for these as the flans were generally smaller than the dies and so could not take the entire inscription). By Zeus' leg there is an ANT monogram for Antioch mint. There would be a Greek letter date at the bottom of the reverse but on this specimen it is mostly off the flan. You can see a trace of what appears to be the top of an A, which would make the date code either AK (year 21 = 29 to 28 BC) or AL (year 31 = 19 to 18 BC).